After beating North American arch-rival Canada for only the sixth time in the country’s history before being shutout by Scandinavian nemesis Sweden despite firing forty-six shots on goal, the United States junior national team will have to be especially wary of Switzerland in their third Group A game at the 40th installment of the annual IIHF World Junior Championships on Wednesday. Simply, put the U.S. have entirely too much to lose. There is a very realistic chance that Uncle Sam’s skaters can still finish first in their preliminary round group (provided Canada knock off Sweden, that is) and, thus, secure a much easier quarterfinal round game against the fourth place team from Group B but, of course, the United States must take all six points from their remaining two Group A games, against the Swiss and Denmark, in order to accomplish that goal. Switzerland, on the other hand, will be playing their fourth and final Group A game on Wednesday and must defeat the Americans IN REGULATION TIME or be assured of a last place finish along with the very real possibility of relegation from the WJC’s top tier. As it stands now, the Swiss have never ever beaten the United States at the annual tournament for the world’s best players under the age of twenty having managed just two ties (in 1994 and 2006) from 20 all-time meetings. The United States and Switzerland have not faced off against each other at the annual WJC since 2012 but the last two games between these two nations has been settled by just a solitary goal. Switzerland were blown out by the Swedes 8-3 in their opening game at this 2016 WJC and then surprisingly beaten by upstart Denmark 2-1 before only falling to the always formidable Canadians 3-2 after a shootout. The Swiss benched Gautheir Descloux, the 19-year-old from HC Servette Geneva who started five games at the 2015 WJC, halfway through the Sweden game after he had conceded six goals on just seventeen shots and have not looked back for good reason. 18-year-old Joren van Pottelberghe, the 4th round pick (# 110 overall) of the Detroit Red Wings at the 2015 National Hockey League Draft this past summer who plays in the junior system of Swedish elite league club HC Linkoping (for whom former Lehigh Valley Phantoms forward Andrew Gordon also plays), has performed extremely well in stopping 72 of 79 shots faced (.911 svpct) in two and a half games for Switzerland. The Swiss have a total of four players who have been drafted by NHL clubs including Timo Meier, the 19-year-old winger who was the first round pick (# 9 overall) of the San Jose Sharks at the 2015 NHL Draft and currently skates in the Canadian junior system for the QMJHL’s Halifax Mooseheads. Meier had six points (two goals) in as many games for Switzerland at the 2015 WJC last year but, thus far, has been held off the scoresheet in all three games in Helsinki this winter. Surely, the United States will not want Meier to rediscover his offensive form all of a sudden. Noah Rod, the 19-year-old center from domestic elite league outfit HC Servette Geneva who was the 2nd round pick (# 53 overall) of the San Jose Sharks at the 2014 NHL Draft, had three goals and six points in six games for Switzerland at the 2015 WJC last winter and has picked up right where he left off with two goals and an assist in three WJC games this term. Denis Malgin, the 18-year-old from Nationalliga A side SC Zurich who was the 4th round pick of the Florida Panthers at the 2015 NHL Draft, is pacing the Swiss with three helpers at this tournament in Finland. 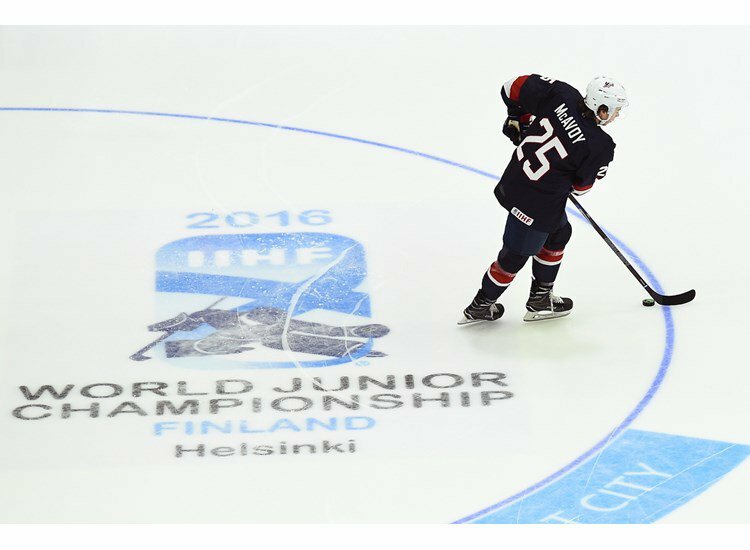 Rod and Malgin are joint top scorers for Switzlerand at this 2016 WJC. Jonas Siegenthaler, the 19-year-old defenseman from SC Zurich who was the 2nd round pick (# 57 overall) of the Washington Capitals at the 2015 NHL Draft and could be turning out for the Hershey Bears in the American Hockey League at some point in the near future, is one of three returning WJC veterans on the blue line for Switzerland. The Swiss must continue to make due without suspended left wing Chris Egli, the undrafted 19-year-old who has skated in seven NLA games for HC Davos this season. Egli will, to review, be sitting out the final game of his three-match ban versus the United States as a result of his hit to the head on Sweden center William Nylander, the 19-year-old from the AHL’s Toronto Marlies who finished tied for fourth in scoring at the 2015 WJC last winter. Nylander, meanwhile, might not play at his tournament in Helsinki again but that is another story. It should be very interesting to see just exactly how United States superstar in training Auston Matthews does against a desperate Switzerland. After all, the talented 18-year-old center who is expected to be the very first player chosen at the upcoming 2016 NHL Draft this summer, only skates in the Swiss elite league for SC Zurich, for whom he has been having an excellent season with 14 goals and 25 points in 22 NLA games. Matthews is club teammates with three of Switzerland’s players at this 2016 WJC and has also played against a number of others on this Swiss junior national team in Switzerland’s domestic elite league. Matthews, who had a goal and an assist versus Canada but was held scoreless – as was the entire United States team – against Sweden, needs to unleash the fury, as Bow Tie Ben would be wont to say.